There are few things better in life than a good burger. You know it, we know it and the folks over at Brades Burgers know it. 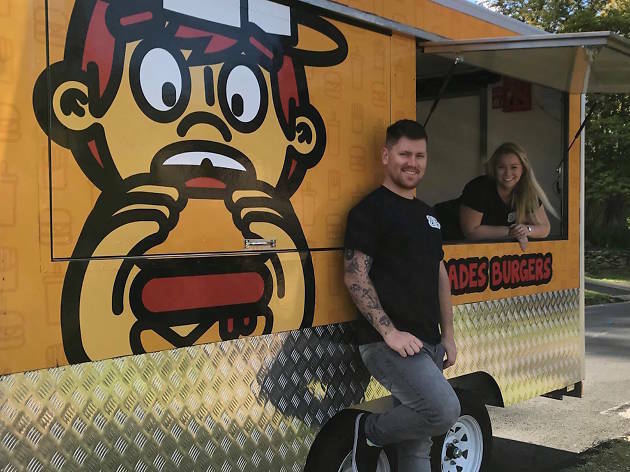 Starting life with a number of pop up locations in Sydney, Brades quickly became popular for serving up quality burgers and sides at low prices, sticking to their mantra of ‘making simple, simply amazing’. As the hungry crowds grew they moved their grill from their pop up stall and into the Brades Burgers Food Van, which can be booked for private and public events. Don’t let the cheap prices fool you – these guys are serious about the quality of their burgers. They source the best suppliers, prices and products weekly to ensure that every item on their menu is made using the freshest of local produce. Brades have a standard burger and sides menu, as well as a few specials that they change up now and then. The Rise n’ Shine is the perfect brekkie burger while the CheeZee pays tribute to the classic cheeseburger, with a generous slathering of the house made special sauce. For those feeling a little bit fancy then the Trufflicious is the way to go, with swiss cheese, spiced pickles and white truffle mayo. For vegetarians there’s the Greenburg, the key player of which is the cauliflower and quinoa patty. The sides menu is equally tempting, featuring mac 'n' cheese croquettes, jalapeno poppers and camembites – that’s five slices of camembert crumbed and fried to gooey perfection. We’ll have one of everything.